Corporate Installations has 75,000 Square Feet in combination with racked storage and with 10 Dock doors we are able to receive large volumes of product! 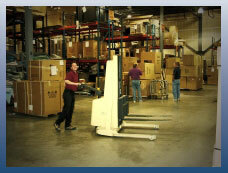 We offer a 24 hour maximum "turn around" time, and 24-7 access to products/merchandise. We have computerized inventories which are updated every 6 months by a physical count (sooner if requested).